The incredible power of dance in any form & genre can inform us of ourselves & also unconsciously transform us. I have been dancing my whole life though not as a professional but because I love to. The therapeutic power of dance and movement is incredibly amazing. I have experienced healing and at that time, I have always wondered what it was. In the past, I just danced and learned the techniques but never completely understand what impact each form of dance and movement displayed. Perhaps at that point of time, I couldn't see it as my eyes have not been opened. Ever since I become a dance movement therapist, understanding, exploring, develop ing an awareness of my body, making connection of my body, mind, emotion and spirit, observing and studying movements, dance and movement hold a different meaning in a new angle. Beside giving sessions and running workshops, doing therapy, we continue to take dance and movement classes. Now I have more time to enrol to be a participant and it is always a nice change to be taught by professional dancers. It will be interesting to feel how it is like to do a ballroom dancing class with my husband. Exploring the ballroom dancing created a special bonding between my husband and me in a non-verbal communication. The synchrony of flow existed between us, the flow of the rhythm moved as one, the gracefulness and gaiety transcended us into a world of joy. I come to understand the magical touch of ballroom dancing. It is not just a dance but it further enhances the relationships and communication with one another in the form of dance where words cannot replace or explain. The shared moments of moving as one in a dance are indeed a beautiful experience. It's natural too to have some clashes, in the process of the clash gave raise to a new change. The sense and perception of oneself as an individual; how we can learn to dance as our unique individuality and with that, glide through the dance floor as one. I come to see the beauty of the different genres of ballroom dancing. It has a meaning if we are open to the discovery of what dance and movement may show and speak to us as a person, as a couple. It does and edifies our marriage to another new level. 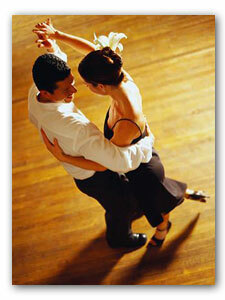 In the ballroom dancing, the man is the leader who leads his partner on the dance floor. The woman will allow the man to direct and be led in the dance floor. Themes can emerge such as Assertiveness, Letting Go, Trust, Body Awareness, Reading Cues, Senses, Proximity, Creativity, Playfulness. A friend (not a dance therapist but a dancer) ever shared that the ballroom dancing became too much for her as the man was too close to her in space. She could not breathe and felt the uneasiness in her stomach. She was surprised when that happened. She reflected and discovered the reasons why she prefers to be a solo dancer and the issue also traces back into her childhood and the parenting she had. That became very valuable information for her. It was just a normal ballroom dancing class not even a therapy. One learning point for us was that my husband learnt how to lead and be more assertive and I learnt how to trust, let go and let him lead in the dance. In the past, I was never good with routines and steps as I prefer improvisation. I used my head rather than trusting my body. There was a disconnection between the mind and the body. After having not done a typical routine dance class for a while, it was refreshing to feel that I have transformed in trusting my body to lead me rather than my mind. I was aware of this blockage before I studied dance therapy. During and after training, I develop the bodily awareness by listening and letting my body lead instead of getting too caught up in my mind. I learn the art of how to translate the steps into my body and let my body lead the way. In return, there is this continuous of body-mind connection moving to and fro. Perhaps some may not have realised the influence and impact a dance form or genre can have upon us. I believe unconsciously, internally, there is something going on and taking place. However, with the conscious awareness, the dance will inform us of ourselves. It is not getting busy with analysing it but to be open to what may come in our body, our emotions and our mind. It can just be simply, I feel the joy deep within while dancing, for instance. Doing a dance is not just about techniques, steps or methods alone but how to translate them into our body and let our body be the voice of that piece. To present that piece is actually flowing out from our emotion of representing not just a story of a dance but very much of whom we are to ourselves and to our audience. It is no longer a show piece but a dance which flows from heart to heart. Why not? Join a dance class today! Creating a dancing dialogue with self and/or with your partner!